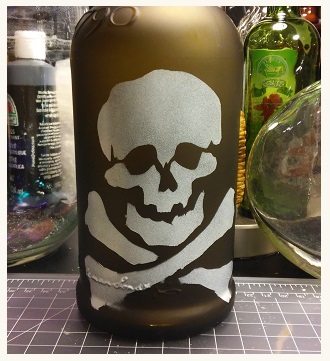 Create a creepy atmosphere with this Skull and Crossbones Stencil Bottle Candleholder. It’s so easy to make! Imagine you’re in a musty, cobweb filled dungeon. The air is thick with smoke and dust and only the dim light of a single candle leads your way to a table with bottles, old books and spiders! Too dramatic? Alright! 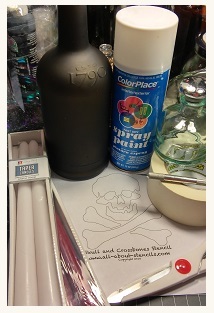 Well, it is scary easy and fun to make this Skull and Crossbones Stencil Bottle Candleholder! Tapers (red and white) – I bought some cheap ones at the Dollar Store. 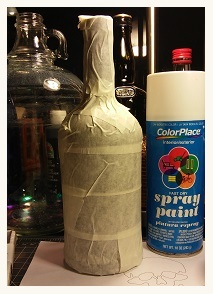 Wrap the bottle entirely with masking tape. I use a wide tape to make this go faster and also there are fewer overlaps to have to cut through. 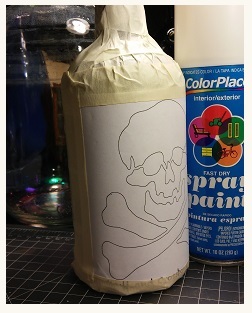 Secure the stencil to the bottle with more masking tape around the edges. Make sure the stencil outlines are still visible. I like to tape all sides completely because when you start cutting there is a lot of pressure exerted on the paper and it helps if it’s tightly secured. Cut along the stencil with the X-Acto knife. Use enough pressure to cut through the paper and masking tape. To keep the bottle from rolling from side to side you can put books, bricks or any other heavy items on each side. Make sure whatever objects you use are lower than the bottle so there is nothing to obstruct your work cutting. Safety first here! Most of the paper will fall away as you cut along the stencil outlines but if any remains just pull it away. 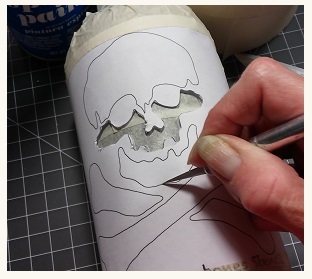 Then carefully using the X-Acto knife or even a fingernail (much safer), push up the edges of the stencil and pull away the masking tape in the shape of the skull and crossbones. You may find that the cut didn’t make it to the bottle in a couple of places so just use the X-Acto knife to trim those areas and clean them up. 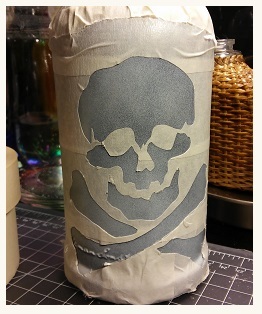 Pull off the stencil paper remaining and the tape that held it to the bottle. Now’s a good time to clean up anything extra hanging on that you don’t like (tape or paper). Of course, you don’t have to clean it up like you would a fine vase. It’s an old bottle of poison after all! Lightly spray paint the bottle with just a couple of passes of spray. Remember this is an old bottle that has been lying around an old dusty lab or antiques or potions shop so don’t try to make it beautiful. Imperfection is art here! 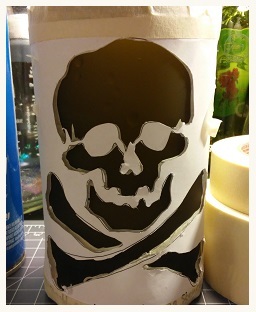 Last, remove all the tape and reveal the skull and crossbones frosted image! 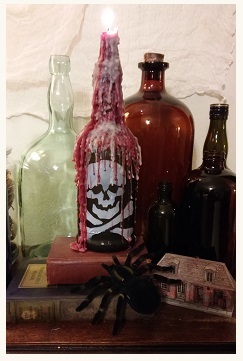 Light one of the taper candles and run some hot melted wax along the rim of the bottle to seat the candle and then let them burn down while the hot melting wax coats the bottle in a gory dripping cascade! I started with the white candle and then went to the red. It took two candles to complete my bottle as pictured at the top of the page but feel free to use as many candles as you want. Of course, you’ll have the candle burning all Halloween and that will add to the allure. 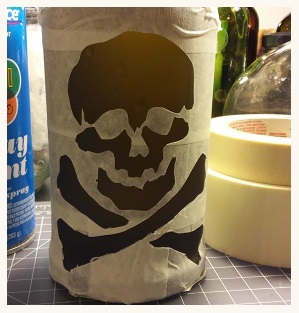 I hope you like this stenciling project and will join us for more great ideas!